Olympics organizers suspended tonight’s track & field events while a downpour assaulted Rio, though not before forcing some athletes to compete in the rainstorm. 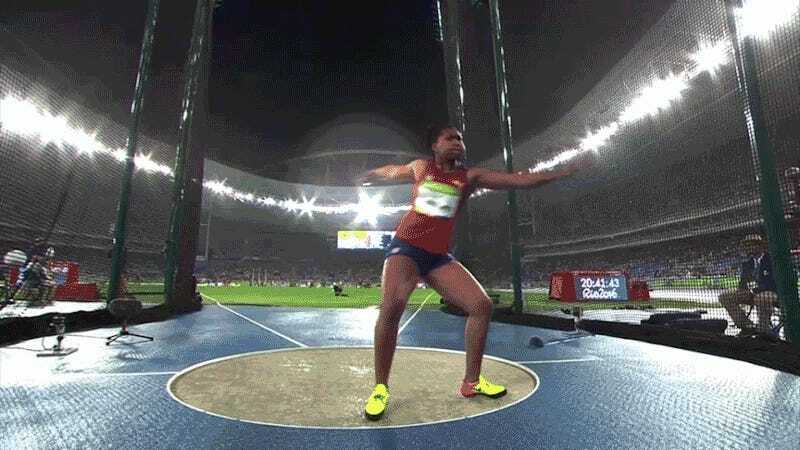 A 110m heat featured hurdlers tromping through a flooded track, though the most ridiculous event was discus—which forced several competitors to take attempts despite it being impossible to even grip the implement. The delay for track events lasted about 20 minutes; discus has yet to resume. Update (8:32 p.m.): Organizers are offering an unprecedented repechage for the two 110m hurdle heats that were run during the downpour; the bottom four finishers from each heat will compete again after tonight’s competition is over for a chance to turn in a better time.